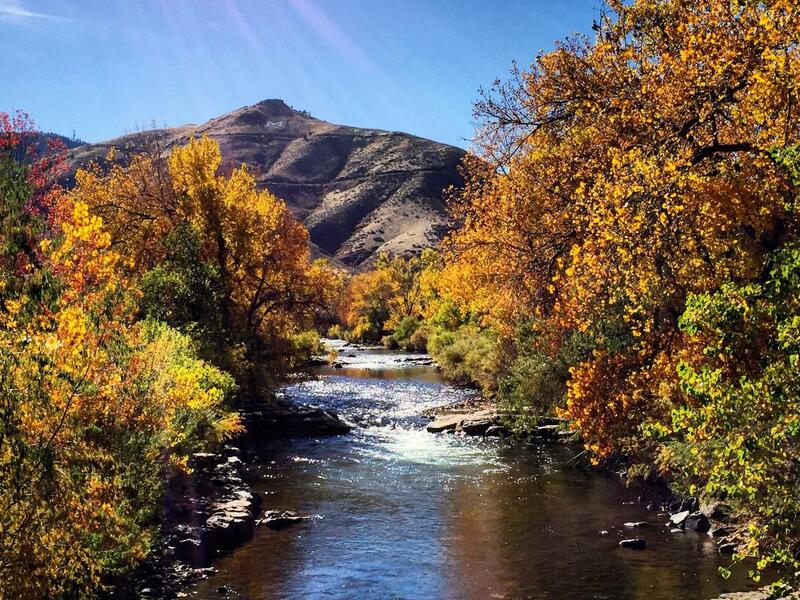 The historic town of Golden, Colorado is a delightful place to experience annual fall colors. Golden’s spectacular location in Clear Creek Valley, surrounded on one side by treeless volcanic mesas and on the other side by the foothills of the Rockies, makes it the place where the mountains meet the plains. 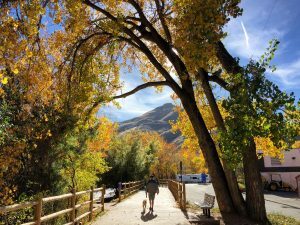 Combine that with one of the prettiest creekside walks in Colorado and there’s no better place to be this autumn than this historic little city, located just minutes from practically anywhere in metro Denver. Plus, on the hikes listed below, you’re never too far from civilization—just in case the tiny people in your life melt down along the way. Hike through golden fall colors, then choose a tasty treat from town. Here are some family favorites. 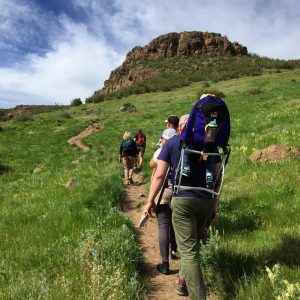 North Table Mountain Trail takes hikers for five miles around North Table Mountain, often with gorgeous cliff views of the Golden Valley. This moderate to advanced trail is easily accessible off of Highway 93 just north of Pine Ridge Road. True, there’s not many trees on this route, but there’s plenty of gold sunshine streaming down on this wild-looking, volcanic mountain of rock. And the views of aspen-covered foothills can’t be beat. Afterwards, stop at Golden Sweets for ice cream, milk shakes, chocolates and more. Clear Creek Trail is Golden’s most popular trail and offers all forms of recreation, from strolling to biking. The paved, mostly level recreational trail stretches from the beginnings of Clear Creek Canyon in the Foothills of the Rocky Mountains, all the way down to the South Platte River in Denver, 19 miles away, offering a tree-lined path with fishing, horseback riding, kayaking – and even gold panning along its banks. But don’t go too far from town; you’re going to want to give Gold Mine Cupcakes a try when you’re finished. Lo okout Mountain Nature Center and Preserve offers the perfect starting point for gentle hiking trails at the top of Golden’s favorite peak. Families can wonder through meadows and achieve great views of both the city and mountains. 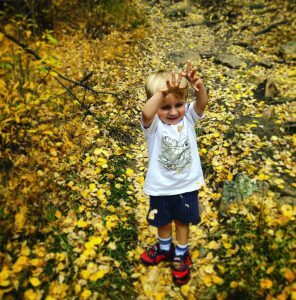 Little ones love to explore the nature center too. For something sweet after stretching your legs, head for Goozell in downtown Golden for delicious frozen yogurt by the ounce. Beaver Trail in Golden Gate Canyon State Park starts across from the park’s visitor center and winds its way through aspen groves and open grassy meadows. On this 2.8 mile loop, hikers earn breathtaking views of Indian Peaks and the Continental Divide. A fairly steep hike, the Beaver Trail earns you at least one pastry from Windy Saddle Café—and maybe a latte to boot! Treasure Hunt for a Glass Orb - Each day in September, a beautiful one-of-a-kind glass orb will be placed somewhere in plain sight in Golden city limits. “Finders” are “keepers” of these treasures, handcrafted by local artisans. Each orb is marked with a special tag and instructions of how treasure finders can register their orb at the Foothills Art Center, where they will receive a certificate of authenticity and be entered in a drawing on Oct. 2 to win a $200 gift card to be used at select spots in Golden. Knock Your Boots Off! Beer Tasting and Chili Cook Off- Head to beautiful historic downtown Golden on October 14 for the Knock Your Boots Off! Beer Tasting and Chili Cook Off. Attendees have the opportunity to taste more than 70 beers and 50 chilis, while listening to live music. Advance tickets on sale now for just $25. Golden Gallop- The Golden Gallop, Golden’s biggest annual race, will explode into galloping motion for the twelfth year running on Sunday, September 24. Starting beneath the City’s famous arch, right in the center of historic downtown Golden, and finishing in Parfet Park besides rushing Clear Creek, the Golden Gallop leads its runners on scenic 5k and 10k loops. Harvest Festival & Trick or Treat Train - Listen to a locomotive steam whistle echo off the canyon walls during the Harvest Festival on Oct. 14 and the “Trick or Treat Train” on Oct. 28 at the Colorado Railroad Museum. Open every day, the largest collection of narrow gauge railroad equipment in the Rockies has model trains, locomotives, cabooses, and rides on the famous Galloping Goose, as well as full operating steam trains running on a delightful half mile circle of track. All aboard!